The Tech Works PA-16HT is a weatherproof Paging Loudspeakers for use in outdoor areas. All metal construction and baked enamel finish make it small, loud and durable. 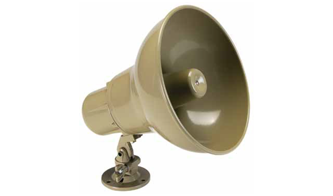 Tech Works PA-16HT is a double re-entrant horn, compression type loudspeaker with an integrated 16W-25V rotary select transformer and an adjustable mounting base. The unit provides average sensitivity of 110 dB SPL, 1W/ 1M, power rating of 16W RMS, frequency response of 450 Hz – 15 kHz, coverage angle of 110° included angle, -6 dB / 2 kHz, half space per EIA standard 426A. Wiring connection are screw terminals to a 25 transformer with rotary switch selectable taps at 16W, 8W, 4W, 2W, 1W.